The sensational video of Izzat al-Duri released yesterday on the occasion of the 65 year anniversary of the Baath party isn’t getting quite the airplay it deserves. 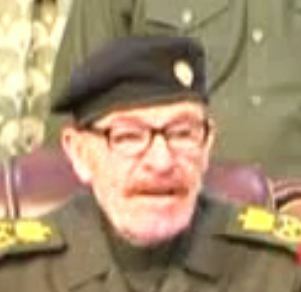 Not that the content of the hour-long speech in itself is particularly interesting, but the sheer fact that, despite rumours of ill health, the most senior Baath leader to survive the Iraq War is confirmed to be alive and well is an important development. 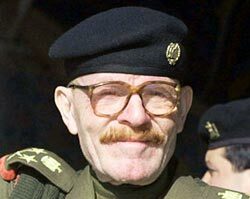 This is, after all, the person seen as the rightful successor to Saddam Hussein by the remaining Baath party faithful. Additionally, towards the end of the speech, Duri reveals some interesting perspectives on the broader regional situation that provide clues as to this possible whereabouts, which for a long time has been something of a riddle. First of all: It looks real. Duri has a characteristic appearance and does not easily lend himself to impersonation. Even though the Baath party specialized in this kind of thing, it seems unlikely that this video is the work of a double. The Iraq-related part of the speech takes up most bandwidth and is the least interesting one. It is a predictable outpouring of anger concerning supposed Iranian influences penetrating everywhere in Iraq and spreading across the Arab world. Not only that, Duri repeatedly describes this as a conspiracy of Persians/Safavids, Americans and Israeli Zionists. Perhaps the most interesting aspect here is that Duri – at 70 and despite conflicting stories about his health situation – had the stamina to gesticulate his way through an hour of these grand theories. The more interesting and newsworthy parts of the Duri speech are towards the very end. Here, he comments on broader regional developments, including the situation in Libya, Syria and Yemen. Regarding Libya, Duri clearly sees developments there as a deplorable parallel to what took place in Iraq in terms of “foreign intervention”. With respect to Syria, there is praise for the “legitimate” and “peaceful uprising” of the Syrian people, though there seems to be concern that foreign (Western) intervention can ensue if things get out of hand. Most remarkably, though, there is much praise for the Saudi king with reference to his efforts to help solve the situation in Yemen. Beyond verifying the relative recency of the video, these remarks help explain the worldview of Duri, which seems to be one in which Iranian and Western interventions in the Arab world must be fought at any cost. Unsurprisingly, given his own religious background, there is more positive praise for the ulama in the Arab world than one would perhaps expect from a Baathist leader, even after a decade of state-led “Islamism” in Iraq in the 1990s. Above all, though, Duri’s remarks on the regional situation may help address that lingering question of where he currently lives. For a long time, it was thought he was in Syria, but the praise for the Syrian uprising suggests he is not there anymore. That leaves the Gulf states as his most likely current location. Given the criticism of the Libya intervention, Qatar can probably be ruled out. On the other hand, the praise for the Saudi king seems to be a credible indicator that he might be there already or is applying for a permanent residence permit. For many years after 2003, the Iraqi Baathist presence in Syria served as something of an anomaly for those seeing grand sectarian schemes and a Shiite axis projecting through the region from Iran via Iraq to Syria and Lebanon. The realignment of Duri and the Iraqi Baath towards the conservative Gulf monarchies makes both themselves and the Syrian regime – now deprived of another Sunni-secular card – look a little more sectarian than before. The more sectarian Shiite media outlets in Iraq will lose no time in seizing on this; as ever, though, the question is whether the majority of Iraqis will allow hyperbole articulated from outside the country to aggravate their own political problems. The Arab League summit in Baghdad is over and it is time to take stock. Given the essentially international character of the summit in Baghdad, it is natural to start with the regional implications. And, in many ways, the degree of representation at the level of heads of state is a useful indicator of how things went. Altogether, 10 countries were represented by their rulers: Tunisia, Libya, Sudan, Djibouti, Somalia, Comoros, Palestine, Lebanon and Kuwait in addition to Iraq. In one way, those who came to Baghdad can be crudely summarized as the “Maghreb Spring” countries (Tunisia, Libya), the very poor in need of any help they can get (Comoros, Sudan, Somalia, Djibouti, Palestine), and “others” not so easily classified (Kuwait and Lebanon). The absence of most of the GCC leaders can be attributed to continued aversion to the Maliki government in Iraq, whereas the failure of the rulers of Egypt and Yemen to show up may reflect the messiness of their own domestic situations as much as any clear policy on Iraq. But there is more to this than the apparent preference of poor republics for building ties with the new Iraq. True, the gap between Iraq and the Gulf countries remains wide, but if the Iraqi government can build ties with non-GCC countries, it could form an alternative regional bloc within the Arab League. The one obvious disappointing absence for Iraq in this respect must have been that of Algeria. Nonetheless, the net outcome of the meeting was a dilution of the GCC interventionist policy on Syria. Thanks to their own lack of initiative and boycott, Saudi Arabia and Qatar had to yield to Arab states that prefer softer language on regime change in Syria. The massive wealth of the GCC states was in itself not sufficient to buy a particular Arab policy on Syria. Also, it is significant that a growing number of Arab states are prepared to interact with Iraq as a perfectly normal Arab state. This is so despite continued attempts by Gulf states to dismiss the Iraqi government as Iranian marionettes. The Arab heads of state who did come to Baghdad probably realized that the town wasn’t full of Safavids after all and that attempts to reduce regional politics to a clear-cut Sunni–Shiite sectarian struggle are futile. (An AP piece claimed “Sunni rulers” shunned the summit whereas in fact 8 “Sunni rulers” were present!) Growing number of Arab rulers realize it is normal for Iraq to have leaders who may or may not be Shiites. The second implication of the Baghdad meeting relates to the level of internal Iraqi politics. Only weeks ago, both the Kurds and Iraqiyya talked tough about bringing Iraqi domestic problems onto the summit agenda. Schemes for unseating Prime Minister Nuri al-Maliki seemed to garner more interest than ever. In the end, though, the domestic situation in Iraq was kept off the summit agenda, and neither Ayad Allawi of Iraqiyya nor the Kurdish president, Masud Barzani, attended the meeting. What Allawi and Barzani need to realize is that their position is increasingly analogous to that of the GCC states within the Arab League. The GCC countries who boycotted Baghdad saw their forward policy on Syria reversed. If they persist in boycotting Maliki, Allawi and Barzani may well experience something similar with their own ambitions domestically in Iraq. Importantly, other Iraqiyya leaders like Usama al-Nujayfi (parliament speaker) and Rafi al-Eisawi (finance minister) showed up at the summit. Their presence highlighted how a letter of protest from Qatar which attempted to speak on the behalf of the “Sunnis in Iraq” was just too unsophisticated to fit the complex Iraqi situation. Even the Bahraini foreign minister opted to have a meeting with Maliki. Perhaps the best indication of the state of affairs in Iraq was the simultaneity of the summit and a mortar attack near the Iranian embassy. The two happened at the same time, but the attack did not derail or even interrupt the meeting of the Arab leaders. These attacks will continue to happen, but they are unlikely to create the collapse of politics in Iraq sought by their perpetrators. Similarly, Iraqi opponents of the Maliki government – who have many valid reasons for being critical – should realize that a policy of dialogue with him stands a better chance of achieving something in the real world. The alternative may well be growing irrelevance, both in the Iraqi political process as well as in the Arab world at large. So, finally, Masud Barzani, the president of the Kurdistan Regional Government (KRG), has delivered his much-anticipated speech on the occasion of the Nowroz festival that marks the beginning of a new year in the extended Persian cultural sphere stretching from Kurdistan to Afghanistan. Much of the content of the speech was predictable simply because it involved reiteration of previously stated positions, if perhaps in somewhat more pitched variants than before. This included strictures on the concentration of power by Prime Minister Nuri al-Maliki (including numerous erroneous descriptions such as saying Maliki “is” the defence minister etc.) as well as not-so-veiled threats about Kurdish secession if the problems persist (“we will turn to our people”). As usual, there are numerous problems in the way the Kurdish leadership appeal to the Iraqi constitution whenever they are in conflict with Maliki, including the contradictive statement “the Iraqi constitution is constantly violated and the Erbil agreement, which was the basis upon which the current government was formed, has been completely ignored.” With its creation of extra-constitutional institutions and its attempts to change the Iraqi state structure by fiat when in fact referendums are constitutionally required, the Arbil agreement is itself a veritable violation of the Iraqi constitution! Whether Barzani will make any progress with these threats remains unclear. As regards an actual move to unseat the government by withdrawing confidence in Maliki, the numbers are more or less as they were in the summer of 2010, when Barzani similarly talked tough but ended up supporting Maliki for PM anyway. The Kurds and Iraqiyya alone do not add up to reach the critical mark of 163 deputies needed to withdraw confidence in the government. 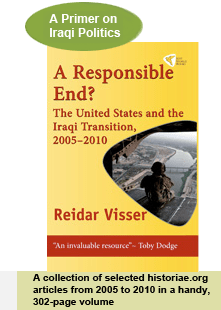 Conceivably, there may be a slight gain in that some Badrists have defected to ISCI during their latest split (ISCI being the most pro-Kurdish Shiite party); conversely, though, we should not forget that fractures in Iraqiyya come prominently on display each time someone in the alliance talks about taking drastic action against Maliki. In that perspective, it is hard to see any difference between this threat from Barzani and his previous ones. However on another and arguably deeper level, Barzani is scoring some successes. Specifically, this relates to the contest of defining the parameters of Iraqi politics. What Barzani always does in his speeches is to portray Iraq as a triad of Sunni Arabs, Shiite Arabs and Kurds. In his commentary on the Hashemi case, Barzani has complained about how the Kurds are being dragged into a conflict supposedly being fought between Sunnis (pro-Hashemi) and Shiites (anti-Shiite) – entirely disregarding the fact that the head of the Iraqiyya party to which Hashemi belongs is in fact a Shiite! This theme was also present in yesterday’s talk, in which Iraqi politics was once more reduced to a struggle between sects. Importantly, Barzani is winning not only the definitional battle over Iraqi politics. He is also transforming the character of the once-secular Iraqiyya party. Increasingly, whether voluntarily or not, Iraqiyya comes across as a pro-federal, Sunni party more than a secular and nationalist movement. Recently, in attempts to address the so-called “balance” problem in government – another Kurdish invention – Iraqiyya leaders have been counting Sunnis and Shiites in ways they themselves described as unthinkable just a few years ago. For his part, if he feels sufficiently threatened by Barzani et al., Maliki will probably turn to the Sadrists as his option of choice, something which again would underline sectarian polarisation. In a way, Barzani and the Kurds are honest. They often articulate their independence dreams. Similarly, that a Shiite party like ISCI sometimes talks like this is perhaps not so suprising either, since its sectarianism is often expressed very clearly. The more remarkable aspect in all of this is the constant fraternization by an avowedly secular and Iraqi nationalist party – Iraqiyya – with these basically separatist forces.